The solid surface of our planet seems deceptively placid most of the time, but actually consists of a thin hard crust of solid material floating on a liquid ocean of molten rock. Much like oatmeal boiling on a stove, the top surface on which we live actually moves and drifts in chunks, carried by the currents of the underlying liquid material. While the motion of these pieces, called plates, is slow to human perception, it is quite real. Along the junctions between crustal sections, stress builds up as the main body of the crust moves in one direction, but the edges where they meet slide past each other unevenly. 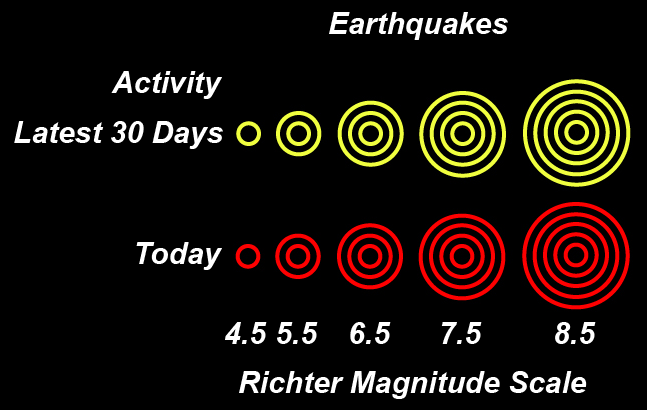 Earthquakes occur when the stress exceeds the ability of the rocks to stick, and suddenly a section of a crustal boundary snaps suddenly in one direction.